The 1937 Chinese film Crossroads is now available on archive.org. The 1934 Chinese film The Big Road is now available on archive.org. Min mamma hette som flicka Anita Grenholm och bodde i Kålaboda tillsammans med föräldrarna Folke och Britta samt de tre syskonen Rune, Bengt och Märtha. Vid sexton års ålder flyttade hon hemifrån (men mormor och morfar bor fortfarande kvar). Tids nog träffade hon min pappa och gifte sig. Hur många träffar får din mamma på Google? Xiamen (厦门) is a coastal city in Fujian province, China. It was one of the first cities to open up to foreign investment in the 1980’s and has seen good economic growth since. Only 16 km from the city center, Tenglong Aromatic PX is constructing a 10.8 billion RMB chemical plant that is expected to produce 800,000 tons of paraxylene (PX) per year. Fears of an environmental disaster has lead to the rise of what looks like a grassroots movement to stop the plans. There was some movement in the Chinese blogosphere and in the middle of May Memedia reported on anti-PX graffiti in Xiamen (the blog of the graffiti artist has since been shut down). On the 25th of May, an SMS began spreading like a virus among the 1.5 million residents of Xiamen, being resent nearly 1 million times and also posted by some bloggers. Taiwan top fugitive Chen You-hao and Xianglu Group’s joint venture has already begun construction of the PX plant at Haicang. Once this extremely poisonous chemical is produced, it will be like an atomic bomb for the people of Xiamen, we will have leukemia and deformed babies. We want to live, we want to be healthy! International groups prescribe that this kind of plant must be at least 100 km from cities, but our Xiamen is only 16 km away! For the sake of our grandchildren, take action! Join the 10,000 people march, beginning at the 1st of June at 8:00. We will march towards the City Hall. Wear a yellow arm ribbon! 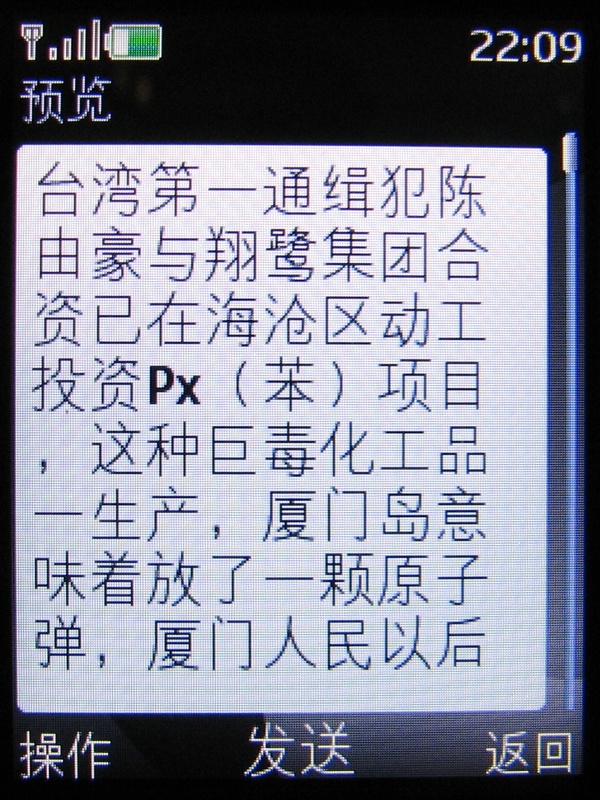 When you read this message, send it to all your friends in Xiamen. On May 30 the local authorities held a press conference and declared that the project would be put on hold in response to public opinion (reported by Xinhua). Despite this, demonstrations went ahead on the 1st of June. Zola (“China’s first citizen reporter”) was there and reported both via his blog and twitter, as did shizhao. Good English information on the demonstrations has been provided by Jeremy Goldkorn and John Kennedy. More than 10,000 people attended the demonstrations that even continued for a second day. Although there were some reports of injuries, the authorities seem to have kept calm and not interfered much.